Unlike most other Yearbook Companies we are the printers so there is no third party print company to pay, which makes us on average 30% cheaper than other UK Yearbook Companies. So confident are we that we can keep our yearbook prices the lowest in the UK, we will beat any like for like quote from any other UK yearbook company by a whopping 20%. Comparing prices? Our premium school yearbooks are printed on thick arctic white 160gsm satin photo book paper, perfect for photo printing. And when it comes to our School Yearbook Range we excel here as well, providing school yearbooks in 8 different sizes, more than any other school yearbook company, providing schools all the choice they could ever possibly wish for. We also have 3 School Yearbook ranges to suite your school's and parent's budgets: Premium Hardback, Softback and Entry Level Booklets. We also have a fantastic Online School Yearbook Design software website on our ASK Print Design platform where you can build your Yearbook, with 100s of Backgrounds, Clip Art images, Templates and Themes. Or if you want to work offline, we can provide you sample InDesign or Microsoft Publisher layouts, backgrounds and designs to help provide inspiration for your yearbook. And last but not least, we know you will want your yearbook cover to have the wow factor, so if you need it we offer a FREE cover design service. We have hundreds of yearbook design layouts, backgrounds and resources to help you create your perfect school leavers yearbook! 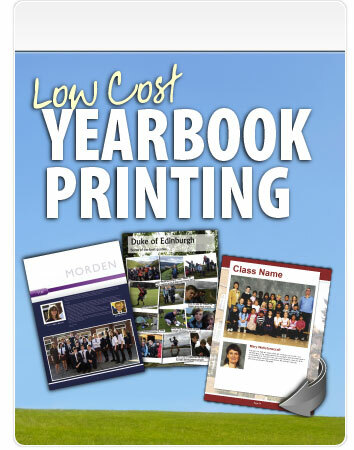 See our transparent and low cost school yearbook printing price list, remember we will beat any other UK Yearbook Company price by a huge 20%. Request our FREE sample Yearbook demonstrating our Premium Quality that has schools returning year after year and containing some example layouts and a useful Printing Guide.